After a ferociously noisy start to the previous weekend with angry electrical storms booming around the UK, I seemed inclined to gravitate towards some peace and solitude in the days that followed. In reality, many of us need some quiet time at various intervals, whether this is to escape from a stressful day at work or simply chill. I tend to get my fix of calm in the solace of our cottage garden during the Summer months but I also see the importance of creating a 'quiet zone' of calm and tranquility in the home, somewhere for me to escape and relax, an uncomplicated design with plenty of pale neutral - my very own Switzerland! 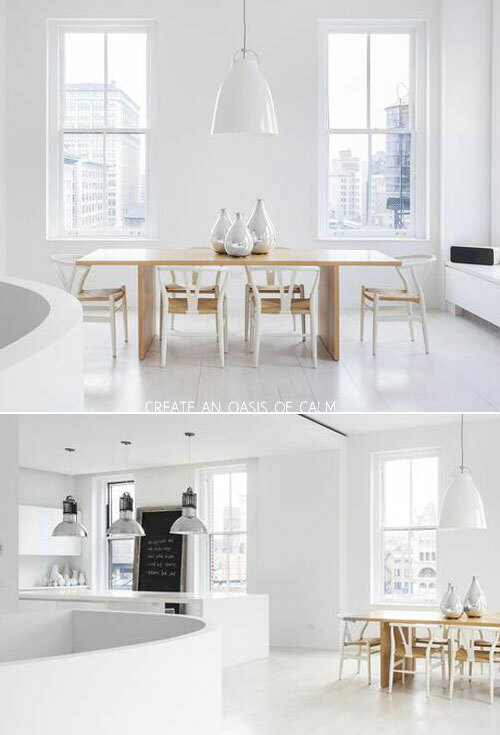 I love the idea of a fuss-free kitchen like the one above, I imagine it would feel like working on a blank canvas with plenty of room for a clear head - perfect for dreaming up new recipes for Brit Decor Bakes! I'm a huge advocate of using open shelving in kitchens, its a great way of displaying your favourite crockery and glassware. Simple monochromatic detailing can also be an effective tool for adding definitive detailing but for your quiet zone, keep it to a minimum adding flash points of contrast. 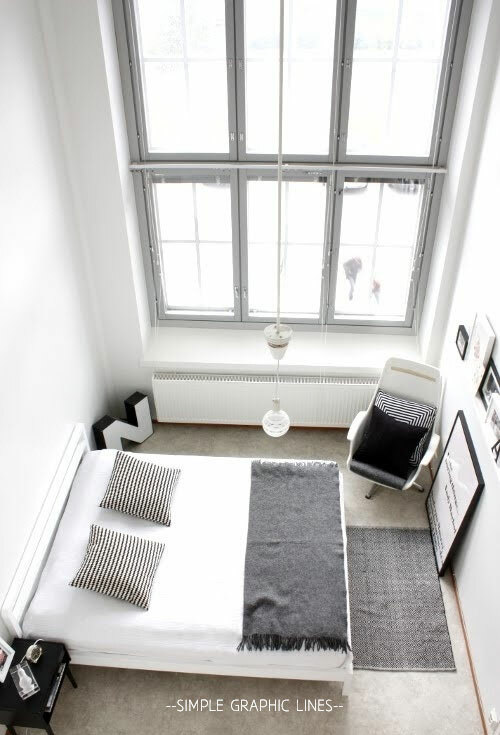 Simple black & white stripes or a graphic black font on a print can bring just the right amount of interest to a scheme, without over-complicating, like this stunning bedroom in image two (above). 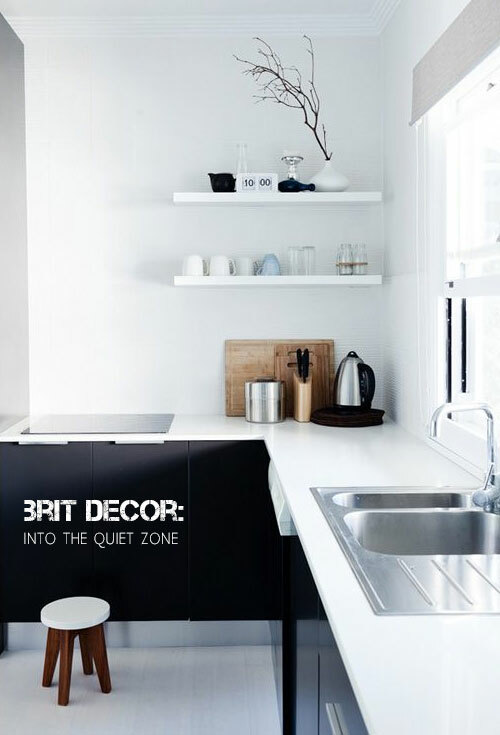 The third image shows us how a quiet zone can also become a centrepiece; an oasis of calm against a bustling Manhattan backdrop, in this instance. Try forming a cluster of neutral-coloured objects, light pendants, vases, etc in one area for interest and focus but go easy on numbers and don't over do it! 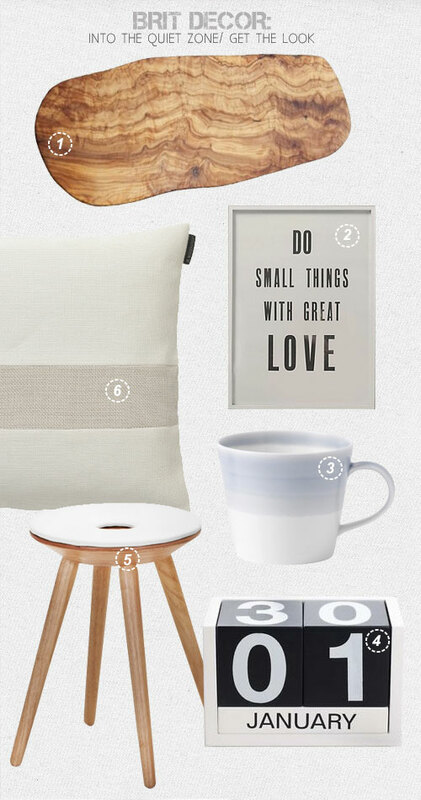 Check out some of my top 'get the look' picks below - it's a close call but I think my absolute favourite has to be the watercolour dreamy blue '1815' mug from Royal Doulton. Which is yours?